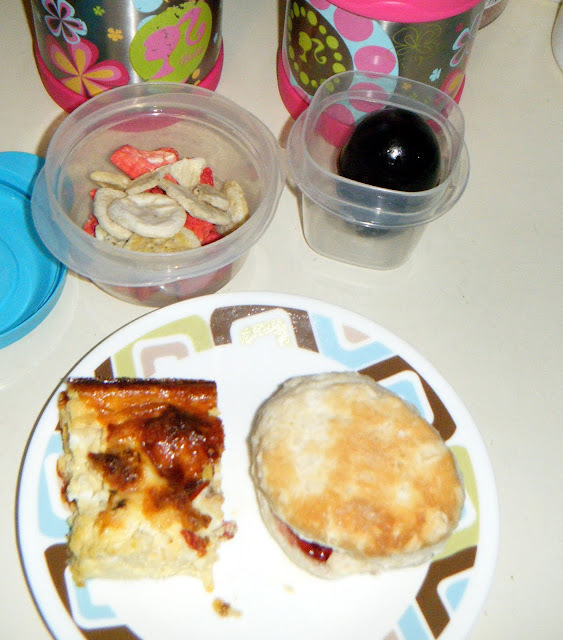 Contents: Quiche (cheese, onions, and tomatoes) dried fruit, a biscuit with jelly and butter, a black cherry Jello jiggler egg, and strawberry milk. Notes: I love quiche, but my wife and I have to find a healthier recipe. It has a lot of cream in it, but man is it delicious. Swap the cream in your recipe with evaporated milk (NOT sweetened condensed milk). Evaporated milk comes in lowfat or fat-free varieties, giving your recipe that creaminess with much less fat than cream! The eggs were made with skim milk. The biscuits actually came home uneaten and the jello jiggler was made with sugar free jello. The fruit is all natural dehydrated fruit. Not sure how one can say there is too much sugar in fruit? As far as the flavored milk goes, I use 1/2 the powder the container recommends and they like the taste. Thanks for the tips on the quiche. Sounds healthy and delicious Lea. I use Julia Child's recipe from The French Chef cookbook, but I use skim milk and omit the dots of butter on top. It's delicious, but healthy! Many fruits are actually quite high in natural sugar. That's why they're strictly limited on a diabetic diet. I think the meal is great for it's combination of textures/interest which goes a long way toward developing a broader diet for kids. I don't think having cream in the quiche is a concern really... I think overall this particular combination is a little too "processed" to be the best choice. Personally I believe dehydrated fruit to pretty close to candy nutritionally, and I'd rather not include anything artificially sweetened. I'd skip either the jello or the biscuit (scone) and replace with some carrot/celery sticks and cherry tomatoes.